Nagano is cold in winter. Ok that’s not strictly true. Nagano is in fact, absolutely, bloody, freezing in winter, which perhaps explains the presence of a Winter Olympics here. It’s not Hokkaido but frankly it’s still pretty damn cold. Why is this an issue? Well, I live in Japan, possibly the only economically advanced nation in the world utterly bereft of insulation, double-glazing or central heating of any kind. So why do I not care about this? Because the Japanese have over the centuries come up with many interesting approaches to keeping warm on those crisp, cold winter nights. The masterpiece of all this winter combating wonder is of course the kotatsu. In the grand scheme of Japanese heating gadgetry this is the last step. So I’ll come back to it in a moment. First up, because the Japanese are usually very practical people indeed is warm clothes. Ok, I understand you were hoping for something more technologically advanced but as my erstwhile Swedish housemate once told me, he wasn’t a wuss for wearing thermal underwear during the British winter, rather he had a healthy respect for the cold. A respect, which we in England, he noted, lack to a quite insane degree. Any brief thought I may have had to defend my land was quickly dismissed by the unwelcome mental image of the average overweight Newcastle Utd fan on a Saturday afternoon in January; shirtless, rolls of fat cascading down over ageing denim and endless tattoos declaring an undying allegiance to the Geordie army whose main rival one might surmise to be the cold itself. But back to Japan, with its citizens quite adamant about its clear and distinct four seasons (to the extent that my students always look rather smug when I explain the English seasons as one week spring, two weeks summer, a damp squib autumn and a never ending wet and windy winter), there is a quite dramatic shift in seasonal clothing as summer clothes get packed away and the autumn and winter wear is brought back from that nook in the bottom of the cupboard. Next comes all manner of electric blankets and under carpet/bed sheet heaters. Each designed to keep you warm wherever you choose to plant yourself for the duration of the day because frankly, you’re not going anywhere. This is coupled with great big space heaters, occasionally with a hot plate on top for keeping a kettle full of water always ready for the gallons of green tea you are likely to consume in the course of trying to warm your poor frozen extremities. But while all these things are necessary for one to get a cozy night’s sleep, or not to freeze your big toe off upon initial contact with the floor in the morning, they all pale in comparison to the mighty kotatsu. 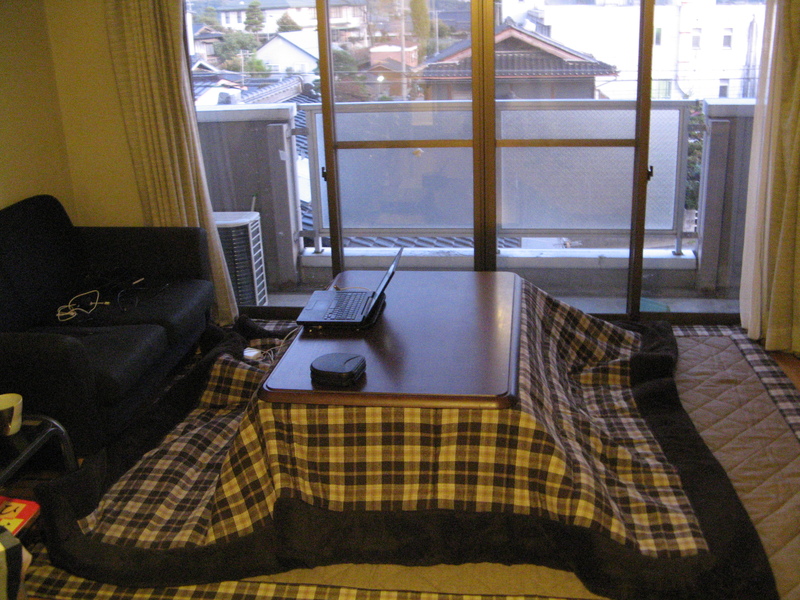 The kotatsu is truly wonderful thing in my mind. The first thing I bought in Japan that turned my one room studio apartment, bereft of most furniture beyond the absolute bare necessities on my arrival, into something resembling a real home. Albeit, a perennially messy and cluttered one. A kotatsu is essentially a blanket or duvet placed atop a low level table frame with the table top itself placed on top, thus sandwiching the blanket/duvet between the table frame and tabletop. In addition to this modern kotatsus have an electric heater installed on the underside of the table frame to heat the space under the table. To put it in a more western context, remember on cold winter mornings how you would clamber out of bed and drag the whole bed cover with you, wrapped around you and dragging behind as you went downstairs to watch Saturday morning kids television, before cable and satellite television killed off the children’s variety show that is. Now add a table so that you never, ever need move from your cosy spot in front of the TV, and that’s a kotatsu. It’s also a way to be very lazy indeed. Without noticing your kettle will strangely migrate in the night to find a new home atop the kotatsu, soon your legs will rebel at the thought of ever leaving their cozy new home and bed will become a distant memory as you begin to nap beneath your new abode, content in the knowledge that when you awake the kettle is already in reach. This winter is going to be very lazy indeed. Bound at the ankle and being screamed at in a high pitch wail, my life in Japan had once again taken a turn into new realms of oddness. Hold on, take a deep breath. And my bound ankle? I was in a three-legged race with the other kindergarten teacher. See? Now you feel bad for leaping to such filthy minded conclusions. There’s your mind launching headlong into to the seedier side of life and I was merely attempting to write a somewhat dramatic introduction to a day in my otherwise uninteresting life by dropping you into the middle of the action. That action being a typical Japanese sports day or undoukai as it is known here in Nippon. Now just because the kids were adorable doesn’t mean this event was any less rigidly structured than the rest of Japanese society. It’s always worth remembering that the Japanese don’t do anything by half. You work until you drop, whether in high school or as a suited salary man. Everything must be cute, even the animation on the TV at the Driving License centre imploring you to do up your seat belt or risk a violent, long jumper-esque death through a windshield. Sports clubs require daily dedication. You must maintain true Japanese traditions, shrines and temples dotting the countryside. You must embrace modernity, McDonald’s and KFC dotting the freeways. Spirituality is not hidden away, but a church will sit opposite a hostess bar. Gambling is banned but Pachinko is everywhere. Japan is a safe, relatively crime free country… oh look a Yakuza in the front row of the sumo. So of course, the Kindergarten Undokai, or sports day doesn’t escape this. Teachers and the PTA had been at the school since around four a.m. Parents and family had begun to arrive at around six a.m. in order to drop their blanket on a prime spectator location. Me? I rolled in at ten thirty and sat with last year’s PTA who were the guests of honour. My job has some minor perks. What followed would usually fill me with a certain amount of trepidation. I know full well how long Japanese educational events can last, the organization that goes into them and just how tired people look when it’s all done and dusted. Then there’s the speeches…oh lord. But instead it went by in a flash. The parents of the students made me feel welcome. I chatted in broken Japanese with a member of last years PTA about how cute yet strange the whole day seemed to me and she did her best to explain what the upcoming races were and the rules involved. I attempted to eat as much of the sushi on offer at lunch with the teachers (I’m afraid I rather struggle with the level of Japanese vinegar in the sushi, which is frustrating since the amount seems to vary considerably through the year meaning sometimes I think it is delicious and other times my face turns into a contorted mess) while answering their questions to the best of my abilities. I even raced twice, one time in a centipede race with three of the dads and once in a three-legged race with one of the kindergarten teachers. The strangest part of the whole day was also possibly the most impressive. The dance routines from the five and six years olds were incredible. Bright costumes, highly choreographed routines displaying an excess of cuteness to match the incredible precision of sixty five year olds dancing in perfect time. That’s kind of Japan in a nutshell really, even their love of all things kawai or cute isn’t free of a good months hard work.